Chinese landscape painting developed and flourished in the Tang and Song dynasties (618 -1279 AD). * This shadowbox composition reflects some of the techniques employed by artists of the period to depict panoramas of real and imaginary settings. The elevated viewpoint of the foreground of rough-hewn stone, miniature figures, and live plants leads the eye into the composition, toward smaller fragments and shaved layers of feather rock in the medium distance, receding to snow-covered slopes in the far distance. A recessed fluorescent grow lamp accentuates the surface textures and facilitates plant growth, allowing this composition to be located on any wall, irrespective of available sunlight. 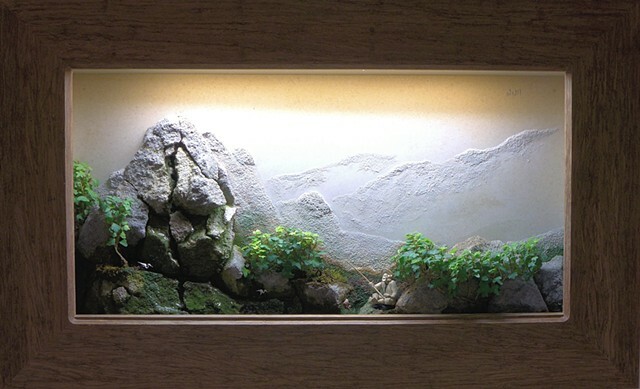 Surrounding the composition is a frame of unfinished strand bamboo.